How Can You Protect Your Business Against Ransomware? What kind of website attacks are you aware of till date? You would say website hacking, malicious activities, malware, and the list is too long. And when we talk about the most vulnerable data attack, Ransomware ranks at the top of the list. Even hearing the word 'Ransomware' seems like a nightmare to the website owners. As per Statista reports, India accounts to hold a share of 4.28% users attacked with ransomware out of all users encountering malware. Once your website becomes a victim of ransomware attack, it seems impossible to get out of it. As soon as the attack happens, your files, folder, customer data, and other information gets locked and you simply can't view the data unless you pay a requested amount to the hacker. But technology has a solution to every problem. So, here are a few points which you must consider in order to avoid and stay safe from the ransomware attacks. Backup Your Systems, Locally & In The Cloud: You need to carry out regular backups, locally and for off-site as well. Go for automatic backups so that you stay on the safer side in case of website attacks and hacking attempts. So, whenever there are any ransomware attacks, you are already prepared with the data backups in advance. Segment Network Access: You need to offer limited data access, which means that your entire network security will not get compromised in a single data attack. Differentiate your network with different credentials for each account so that all the accounts and panels don't get affected in case one account gets hacked. Early Threat Detection Systems: You need to install ransomware protection software which helps you in detecting the potential attacks in advance. Further, you can identify the intrusions as soon as they happen and fix them immediately. Install Anti Malware / Ransomware Software: You simply can't assume yourself that your website is up to date. Rather, you need to install some anti-malware software in order to protect against ransomware attacks. Run Frequent Scheduled Security Scans: If you are not running regular scans on your computers and other devices, the security software is simply useless. You need to carry out regular security scans over each and every device which is connected to your network. Train Your Employees: No doubt, machinery has overruled the manual working of a human, but we simply remove the human involvement from the process. You need to train your staff about the security factors and ask them to keep their PC's, files, and other data locked at all times. Enforce Strong Password Security: You also need to regularly update your every single panel's passwords on a monthly or a weekly basis. Moreover, keep some strong password which is hard to crack on the third party's end. Never keep the default passwords for a long time. Finding an ideal web hosting provider! 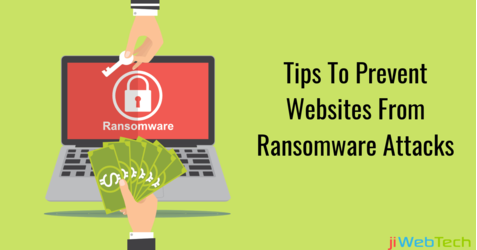 Once you are aware of the damage a ransomware attack can cause to your website, you would definitely look up for an ideal web hosting provider on which you can rely upon at all times. Isn't it? So, you must go for a well reputed and experienced vendor who has a team of professionals for assistance. In case you have any queries get in touch with us at any time and get assistance from our experts. Finding The Root Cause Of ERP Implementation Failures! Why Ignoring Digital Signage in Your Hotel Can Cost You Time and Sales? Is Managed Cloud Hosting The Right Choice For Your Business? Why an ERP is required for Better School Management ? Should You Switch From Shared to Cloud Hosting? jiWebTech offers integrated ERP/CRM solutions that help businesses operate more effectively and see the big picture so they can make strategic decisions that keep them efficient and profitable. © 2019 jiWebTech Technologies LLP | All Rights Reserved.